Soul Electronics Flex review | What Hi-Fi? You may not have heard of Soul Electronics. Though established in 2009, the US-based headphone manufacturer only hit UK shores this summer – with its three-strong fitness headphones range in tow. 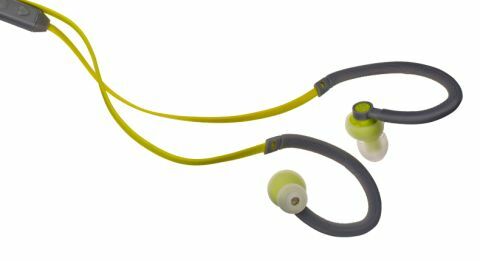 The Flex are the range’s in-ear model (there’s pricier on-ear and over-ear pairs too), and are exactly what they say on the box: ‘high-performance sport headphones’. Take one glimpse at the Flex and you might assume they’re are all style and no substance: their snazzy fusion of lime-green and light-grey are bound to draw compliments (though less statement-making is the black and dark-blue version) and the finer design details – like the company’s ‘S’ logo etched onto the bud – scream quality. The long (1.2m) flat cable, clothing clip and sliding clasp for cable adjustment are all aesthetic – and functional – bonuses, and the silky drawstring case is an extra luxury in the box. But the Flexs aren’t just a pretty face. Punchy, musical and beautifully balanced, they have the entertainment factor that could tempt you to extend training sessions. Clearer and more insightful than the price-matching Monster and Sennheiser models, they are hard to fault. They multi-task their way through Michael Jackson’s Slave to the Rhythm: timing well and keeping track of the clicky sounds that shower the soundstage. And with tight unity between the forward, focused midrange, sparkly treble and deep, controlled bass, everything gels together nicely. There’s plenty of body to the presentation, and a level of detail and dynamic subtlety that surpasses expectations at this price. Skip to Macklemore and Lewis’s Can’t Hold Us and piano notes have texture and variation, while the rap’s short, sharp bursts of explosiveness are clearly communicated. When it comes to functionality, Apple users are in luck. Like most headphones today, the Flex’s in-line remote is designed with iPads, iPhones and iPods in mind. The two heart-buttons control volume, while the middle-key pauses music, skips tracks and – if plugged into your smartphone – answers phone calls. Android and Blackberry users aren’t completely left out, but operations only extend as far as pausing music and answering calls. The remote is also in keeping with the competition by being sweat-resistant – the cable and buds are waterproof to IPX5 standards, on the other hand, so should cope with rainy weather and time under a tap. Our favourable opinion is confirmed by their fit. It’s comfortable and – as the name suggests – flexible thanks to some bendy and soft (though far from flimsy) ear hangers. Ridges etched into the rubber also help with grip. Thanks to soft ear-tips (there’s four sizes to choose from) and a silicone coating around the buds for extra protection, we never feel the need to take them off or adjust them for any exercise. Soul Electronics might be up against household headphone brands, but they come out on top. Winning points for practicality and performance, these will make ideal training partners.